well It makes no sense to take the risk of a burnout of Astrid. we had to go back. I compare it with an athlete: you did everything for being a part of a championchip, you trained hard and with a high level of discipline, no alcohol, correct food, low sparetime and suddenly you got injured or ill and "game is over". Never have been so disappointed like on this day! Honestly when we turned back I had tears in my eyes, but we are one team and it is self-evident to care for each other. 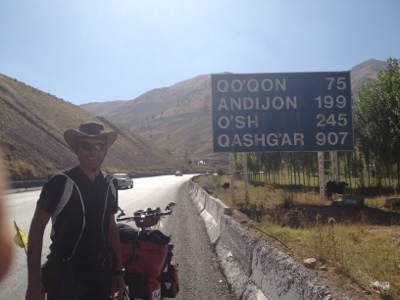 we left Osh and cycled in direction to Jalal-Abad. 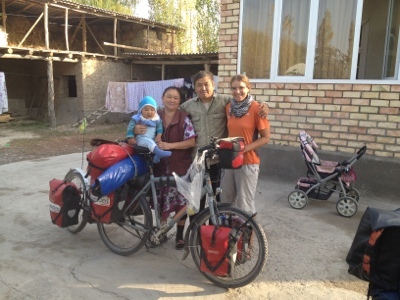 we met Chris and Anna from Germany, coming from Bishkek. 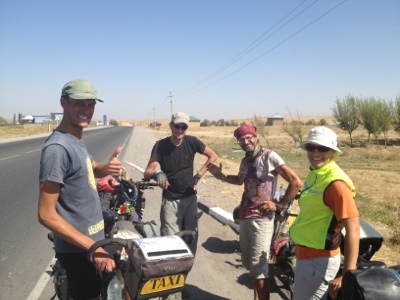 only 15 min later we met Mark from GB, Timon from NL and Bart from Belgium, coming from Bishkek, too. in the evening, we tried to find a campsite, but there were only houses. we took a sideway and asked a man if we are allowed to camp on the lawn next to his house. 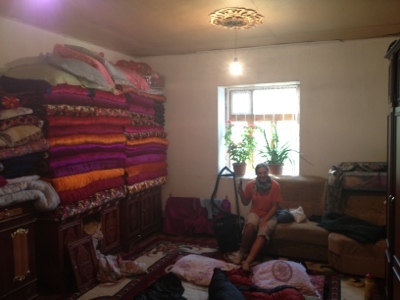 he invited us to his home with his family and offered us a possibility to sleep. a chicken soup for supper , how delicious! 54 km , 40km by truck. 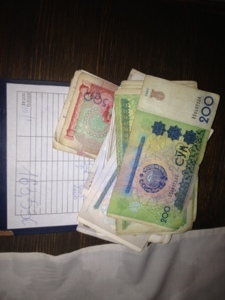 we left our host and he asked for money.... hm, seems to be a different understanding of being a host between Europe and Central Asia. I gave him 200 Soms, what is roughly 5 USD. only 36km. Astrid was not fit again. in the afternoon we had a beer with two man on the street. camping at a river. 24km uphill on a gravelled road. indeed a hard job.several farmers with cows and sheeps. we did not know if it would be possible to cycle to the mountains. a severe sheep desease was currently there and many animals died. some areas have been quarantined. after 35 km we camped at a river with campfire. we had a outdoor-shower and suddenly a big flock appeared and one of the shepherds on his horse joined us for supper. he was well informed and it was so funny to talk with him. he told me to sit on his horse..... well, I would like to ride a horse in KGZ!!!!!!!! 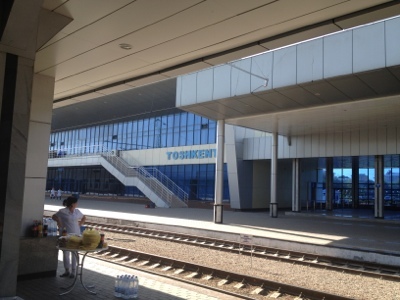 and take a bus to Bishkek. camping close to the river two days ago.24km. we started climbing a hill of 12%. not long but tough for Astrid. she was really exhausted. After 55km of light downhill we tried to find the restaurant where we stopped five days ago, but we missed it. we had to climb another 12%, now for four kilometers! Astrid was so hard to herself. on the summit we stopped and drunk some water, always looking for a truck which can take us to Osh. after ten minutes one stopped and asked us !! good luck and no hesitation! we approximatley saved two days of cycling. well, we are on a bicycle-trip, but if it is necessary to take another means of transportation we take it. there are other cyclists which refuse this attitude, but it is everybodies free decision. 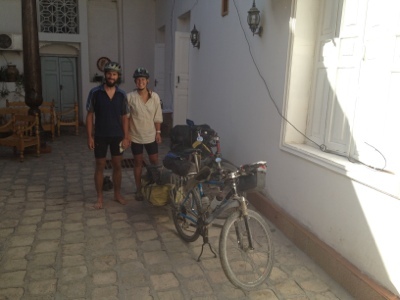 after 60 km we hoped out and cycled 6km to our guesthouse. we had luck, we got the last room again. what a day ! a long breakfast with the tourists from Switzerland and Germany. 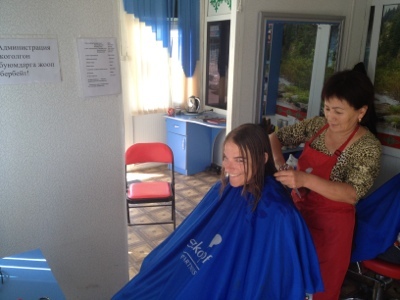 one of the Swiss tourists supports the aid organisation "HilKa" what means "Help for Kazachstan". he told us many interesting things about KAZ and the organisation. 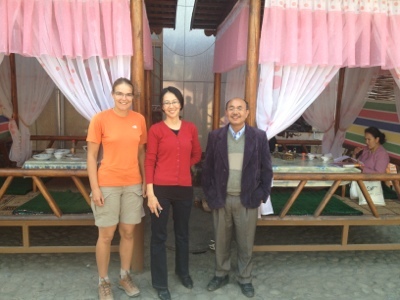 We met Aikokul and her collegue Basil for lunch. 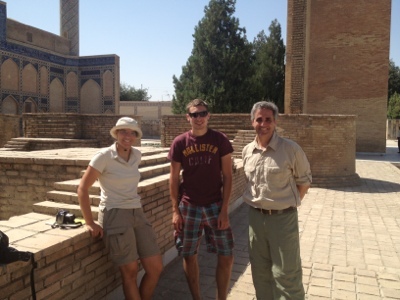 she studied in Magdeburg/Germany and Prof. Heiko Schrader, whom we met in Bukhara, is her tutor. she works at the German GIZ, the "Gesellschaft fuer internationale Zusammenarbeit". in the afternoon we made some backups and slepted a little bit. in the evening we went to a small restaurant, its name is "California", and was recommended by Peter, a Dutch. 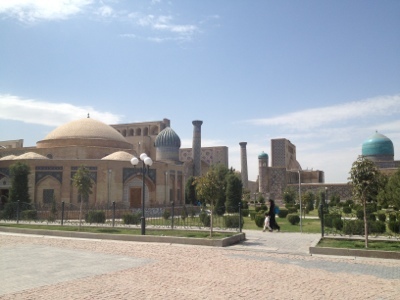 He has been working in Osh now for two years, leading a project to develop the region around Osh. Two years ago there were rumors and many buildings have been destroyed. After a delicious meal, with hamburger and french fries with ketchup for me, pasta with pesto for Astrid and icecream and cake we took a taxi to our guesthouse. Due to the fact that Astrid had increased temperature we decided to stay one day longer. the coming days will be very tough so it made no sense to cycle with reduced power or take a risk to endanger the situation. Astrid was still ill.At the breakfast there were two women from the GIZ in Bishkek, one was German and usually lives in Stuttgart. 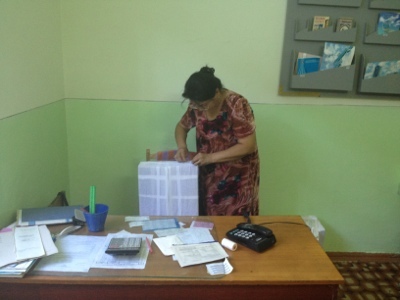 They have a project in the educational sector. Unfortunetly they had to catch the plane, so it was too less time to get more information about their work. after breakfast I prepared an Excel table for my tax-declaration 2012 and made some researches for our next steps, especially how and where to get the visa for China in Bishkek. 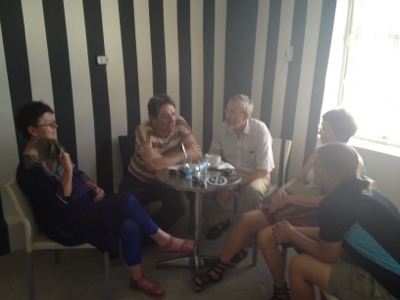 in the afternoon we met a man and woman from USA, living in KGZ and working for the US government. they have a project for increasing the quality in food. in the evening again "Restaurant California". Astrid felt better. 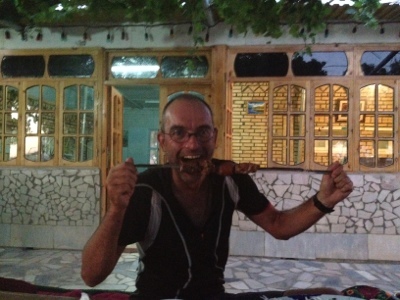 Gerrit from Cologne stayed in the guesthouse, his LP for China supported us to plan the next steps more detailed. you need a special tool. my other one is only fixed with an elastic band but I had it in my bag. we see the harvest of cotton, but only cycling and nothing more to mention. now 5 months traveling. we crossed the summit of the Kamchik Pass. 15 km uphill, 1000 altimeter, 2187 altitude; this was really a hard job. there were two tunnels we cycled through and at the beginning and at the end we had to show our passport. military area again. 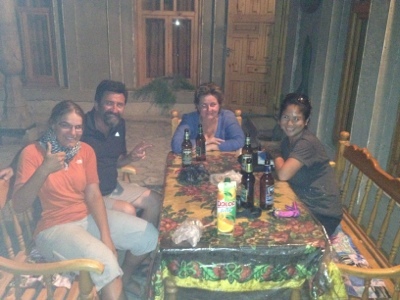 after 48 km downhill to the Fergana Valley wild camping in a plantage. the farmer and his son brought us some fruits.what a surprise! early sleeping at 7:30 pm. to take pictures with us and this can be annoying, but they were so friendly. 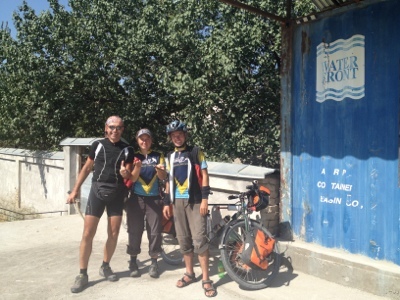 we met Guido from Belgium, cycling through UZ. 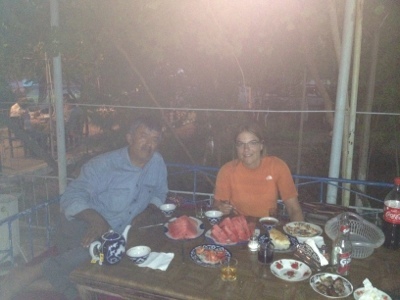 just before looking for a campsite we discovered a watering place and a man offered us a fresh cantaloupe. we filled our bottles and a water bag and found a silent place for camping. we left our host at 8am. during the night it had been raining. first rain since two months on our trip! we had headwind and after 2 km we spend our last Soms for food. 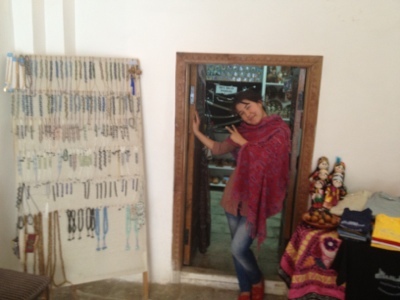 the owner of the shop invited us for tea and some fruits. distance to the border only 25km, but our muscles were aching. we arrived at the border at 10:30 am and got a form to fill out. the same one as on our entry. and now the horror began: I imported 565 USD, in Urgench and Tashkent I grabbed more than 2000 USD at the atm (due to the following countries) and I declared over 1600 USD today. the immigration officer told me that it is not allowed to export more USD than imported. it was a young officer and he tested me, if I will stay cool and friendly. no problem ;-) . well, I asked stupid what to do... I corrected the USD on the form and went back to him. well he asked me if I try to fiddle, but I kept cool and, indeed, he gave me, with a smile on his face, a new form; his order: give it back to me without mistakes ! no problem ;-) . 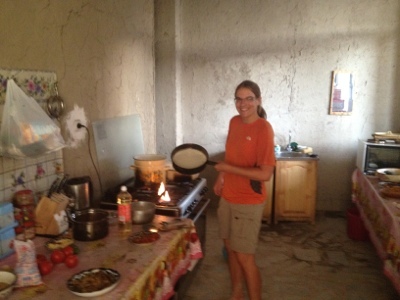 while I have been engaged with filling out the form, he contacted Astrid, asking her about our next steps of our trip. I gave him back the new form and he accepted it!! then we had to put all our bags to the x-rays... he checked my drugs ( not: Drogen) very accurately and wanted to know if I have some with narcotic ingredients. then he checked Astrid's bags. all ok! if this immigration officer would had been very strict, I would have lost more than USD 1000. good luck ! 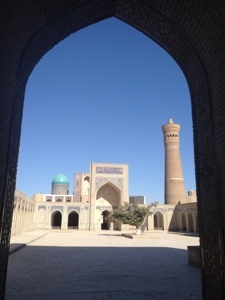 after 2,5 hours full of stress we left Uzbekistan. we met so many friendly people but it is a real police state with a high level of permanent surveillance. 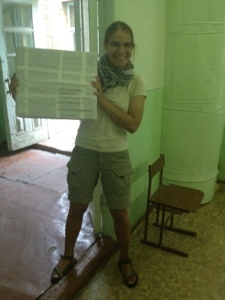 we were tired of sight-seeing, so we made some researches for the next steps on our trip. Chinese embassy was still closed. 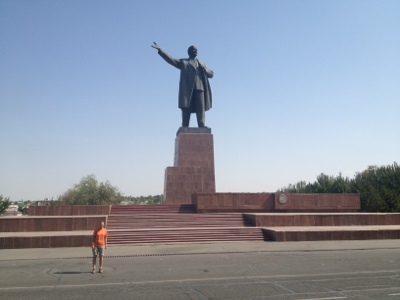 we decided not to stay longer in Tashkent. 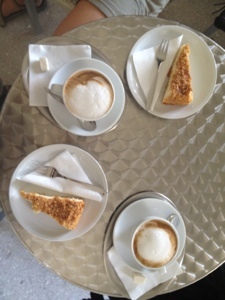 after lunch we walked to the cafe with the delicious coffee and cake. on this day we did 85km, 4h51, avs 17,4, total 4972. at a cafe we had a funny photo shooting with some men from the village. 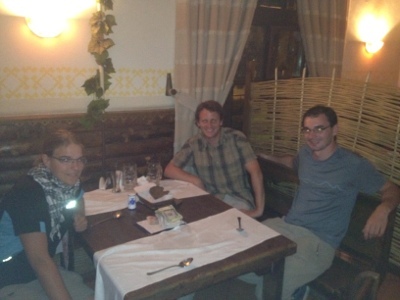 later we met Antje and Wojtek from Leer (Germany, East-Friesland),member of the Tajik Ralley to Duschambe. 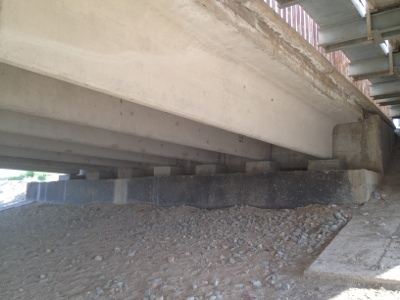 we camped under a railway bridge with access to a channel with quite good water for cooking and washing. 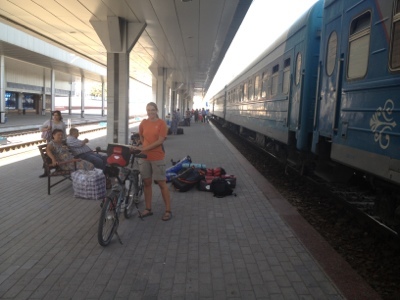 we started at 9 to go back on the main road and made autostop to Buchara; it was 25 km to cycle on an acceptable road. Astrid was not feeling very well due to a coming cold. we crossed a big bridge with many policemen. seemed to be a strategical object. no problems at all they were very friendly.after arriving on the main road we looked for some trucks but they were sealed. there was the new road under construction, closed for all, but possible for cyclists. we cycled 2 km then we went back to a truckstop at the old road. the second trucker we asked from UZ was willing to take us with to Buchara.he transported carpets from Khiva to Navoy and had some space for all our stuff. Big luck ! 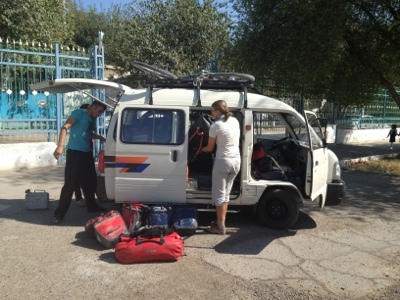 it was the same bad road as in KAZ, now along the border to Turkmenistan. for five hours only an average speed of 15. we were glad not to cycle this rubbish. we left the hotel at the highway and cycled to the city centre, looking for the Hotel "Amulet" which is recommended by "Reise-know-how"- . a German publishing company. what a beautiful city! 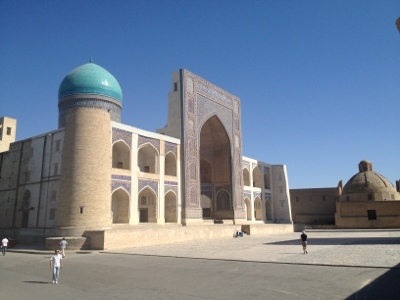 we were more impressed than in Khiva. 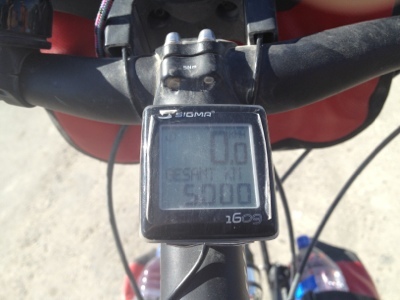 and I did now 5000km by bicycle !! GB, Helen and Joe, who had the same way as us. they met Laura and Ash from AUS, too; small world :-). we had some lunch, I slepted a little bit, Astrid repaired a puncture at her bike, wrote her diary and in the evening we wanted to have dinner. 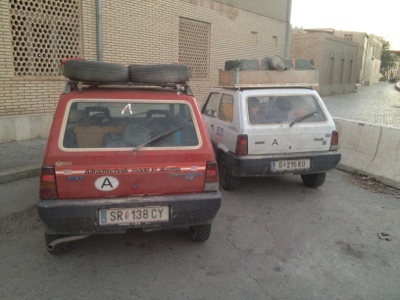 what a surprise: on our way looking for a restaurant we noticed two FIAT "Panda" from Austria (Graz and Steyr) member of the Tajik Ralley 2012, same as Wojtek and Antje from Germany, we have met three days before. Just in this moment I told Astrid "look! there are cars from Austria" a young woman came behind us, from Austria, too. Petra did not belong to the Tajik Ralley, she is a photographer, coming with her partner Juergen (www.autonomaden.at) from Iran. after this small talk we bought some bread, cheese, sausages and beer, went back to the guesthouse and had dinner there. The trip by truck exhausted me more than cycling. all my bones were aching due to the bumpy road. 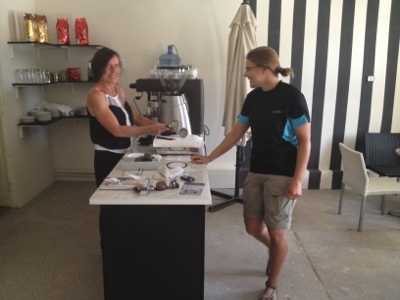 we started our sightseeing-tour but after half an hour we stopped at a cafe; Gertrud from Mannheim (Germany) runs this cafe, offering delicious coffee and German cake. I lived for twenty years in Mannheim and around and there was much to tell:-). two German couples entered the cafe. we came into contact and the two men were professors for sociology at the University of Magdeburg. 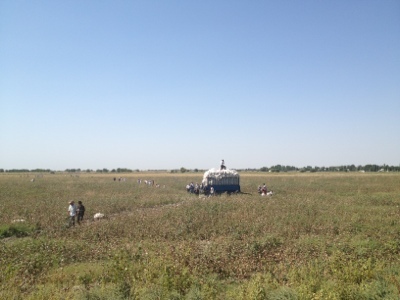 they manage a project in Kazachstan and Kirgistan which studies the households with their rural and familiar structure. they told us some details and we were really impressed. we stayed longer in the cafe than planned but it was really great to met them all. we did a little bit sightseeing and then went to a internet cafe to make some reports and backups. in the evening we had dinner at our guesthouse and had a conversation with a couple from Spain, cycling through the world , too. in the morning we had a guided tour through Buchara. much better than walking on your own. we met Juergen again from Austria. he told us some details about Kirgistan, which are very important for us. and Astrid and me wrote some postcards. 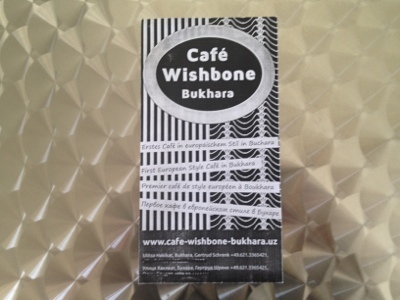 we wanted to have German cake again so we walked to Getruds "Cafe Wishbone" and had a delicious "Marmorkuchen". so yummy :-)). Heiko, the professor from Magdeburg and his wife, Cordula arrived, too. again a funny meeting. well, you remember, that more than a month ago, Astrid had an accident and needed to be stitched at her left hand and knee. she had splinters of glas in her wounds, but the doctor assured that there is nothing more. four days ago Astrid removed a 5mm glass splinter out of her hand. really no reason to be amused! now, Cordula, she is a doctor inspected the scar and there is no more problem. thank you very much, Cordula ! at 5 pm we had our wellness-programm: visiting a hammam from the 16th century. how relaxing!! all the stress from the desert disappeared. in the evening we met Tim and Sharyn from Down Under and Elisa from the US. 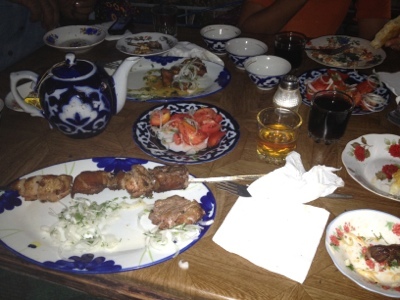 we had our supper with them and they told us important things about Kirgistan. we keep in touch! and she was not feeling very well, same sypmtoms as Astrid. pain in my stomach. whole day ill. Dasom was ill, too.. bad day. 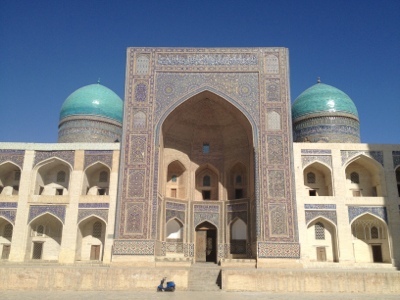 we heard that there were many people in Samarkand who had the same problems. seemed to be a epidemic. 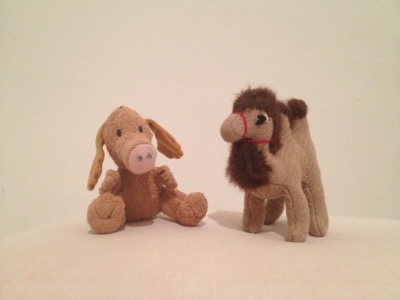 Guenter our inner pig dog is not alone anymore!